Also called Three-Milk Cake and Tres Leches Cake. A dense, moist “three milks” cake topped with a cloud of vanilla whipped cream. 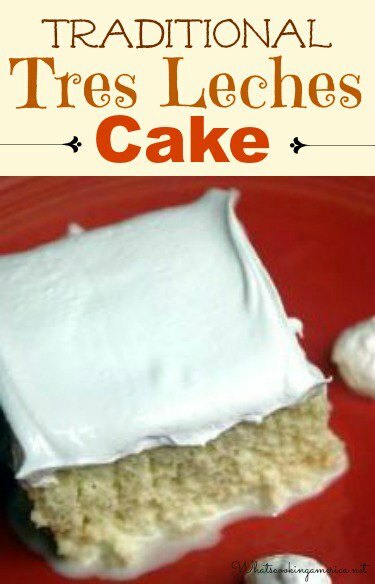 What makes it unusual is that after baked, it is perforated and soaked in a mixture of three different milk products: evaporated milk, sweetened condensed milk, and whole milk or heavy cream, hence the name Tres Leches. The three milks, when combined, create just the right sweetness, density and “mouth feel” for a rich cake, making it moist but not mushy. The cake is like one big giant sponge soaking up the delicious milk syrup. History: There is dispute over where it was first created. It is though to have come from native from Nicaragua by most historians. This cake is very popular in Nicaragua, Mexico, Cuba, Puerto Rico, and Guatemala. I can find no proof of this, but the origin of the recipe is reported to come from the back of an evaporated milk or condensed milk can in Latin America to promote the use of the product. Evaporated milk and condensed milk were sold throughout Central and South America and even the Caribbean. By doing this, the company would boost their milk sales, which was probably the original idea. Condensed milk first came into use in the mid-1850s as a way to preserve milk in cans, without refrigeration. Evaporated milk first became available during the 1870s when milk companies were able to heat the evaporated milk so that it would not spoil in the cans, thereby making the sugar unnecessary. They both became an immediate success in urban areas where fresh milk was difficult to distribute and store. This cake probably became popular in the early 1900s. Today, the use of condensed and evaporated milk is a part of Latin American culture. This Tres Leches Cake recipe and photos were shared with me by Diane Rodiquez of Pleasanton, CA. Diane adapted this recipe from The Cocina Cubana Club (Pascual Perez and Sonia Martinez). Preheat oven to 350 degrees F. Generously butter a 13- x 9-inch baking dish. Prepare the Cake Recipe. While the cake is cooling, prepare the Three-Milks Syrup. Once the cake is completely cooled, pierce the cake thoroughly (every 1/2 inch) with a long-tined fork (wiping fork occasionally to reduce sticking), taking care that you do not tear the cake up. Place the cake (in the baking dish) on a rimmed baking sheet (this is to catch the syrup when it overflows). Slowly pour the Three-Milks Syrup over the top of the cake, spooning the overflow back on top until all the syrup is absorbed. Cover and refrigerate until ready to serve. When ready to serve, prepare the Topping Mixture. Spread the prepared Topping over the top of the cake and serve immediately. In a large bowl of your electric mixer, beat 3/4 cup sugar and 5 egg yolks approximately 5 minutes or until the yolks are pale yellow in color. Gently stir or fold in the milk, vanilla extract, flour, and baking powder; set aside. In another clean bowl of your electric mixer, beat the 5 egg whites until soft peaks form, adding the cream of tartar after 20 seconds. Gradually add the remaining 1/4 cup sugar and continue beating until the whites are glossy and firm, but not dry. Gently fold the egg white mixture into the egg yolk mixture. Pour the batter into the prepared baking dish. Check out How To Make Perfect Egg White Meringues. Bake approximately 40 to 50 minutes or until a toothpick inserted in the center comes out clean. Remove from oven and let the cake cool completely on a wire rack. Once the cake is completely cooled, pierce the cake thoroughly (every 1/2 inch) with a long-tined fork (wiping fork occasionally to reduce sticking), taking care that you don't tear the cake up. Place the cake (in the baking dish) on a rimmed baking sheet (this is to catch the syrup when it overflows). In a large bowl, combine the evaporated milk, sweetened condensed milk, cream, vanilla extract, and rum, whisking until well blended. Slowly pour the syrup over the top of the cake, spooning the overflow back on top until all the syrup is absorbed. In a small mixing bowl, beat the cream, sugar, and vanilla extract until stiff peaks form. The origin of this recipe originates in Spain, not Nicaragua. Actually its origination is irrelevant. This is a cake and all cultures have claimed it as their own. The truth is this cake became a staple in many Hispanic/Latino households and each culture claimed ownership. This question has always been puzzling me … When is the right time to eat Tres Leches? At a party? At home doing nothing? When?